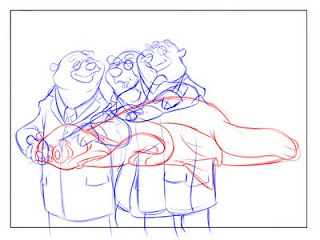 so I've been working lately on some layouts for a NEW spot for Arctic Chiropractic in Alaska. I love the layout stage. 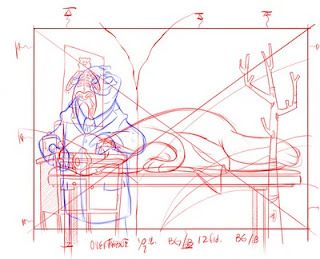 I get to pay attention to acting, poses, composition, background design, aesthetic quality, character, and the animatability of the layouts (maybe they can be used as keyframes in some cases. 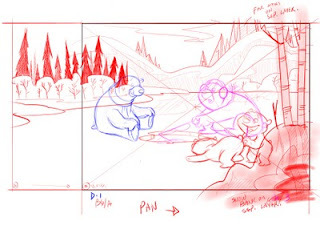 The one with the 'three' bears are the 3 poses I did laid on one BG so you can see the progression of the action. the other one with the family fishing gives an idea of the overlapping and depth of the entire scene. enjoy! Hello, and welcome. This is the place for recent sketches and thoughts from Brian, and if you want to talk about work, either contact him through this (brino@kerplunkanimation.com) or go to the main website to see development work, concept and commercial work, and to start a conversation about films and or animation! I am an animator/designer and filmmaker. I currently teach at RIT in Rochester, NY and I put peanut butter on hamburgers.